The unbeaten Briton could open some huge doors in a win over the seasoned Stiverne. So far, so good for 33-year-old Joe Joyce. The 2016 Olympic silver medalist and former Commonwealth Games champion made the leap into the paid ranks just over two years ago now, and with a 7-0 record featuring a 100% knockout success, the Juggernaut is primed and ready to make a big step up in 2019. Announced on Wednesday this week, Joyce will take on former sparring partner and world titlist Bermane Stiverne on the undercard of James DeGale vs Chris Eubank Jr at London’s O2 Arena on Feb. 23; with a record of 25-3-1, the 40-year-old Haitian is reaching the end of his bruised career. Joyce has been bubbling under the surface since 2017. With wins over a who’s who of the international heavyweight division, the Putney-born heavyweight has learnt his craft in the paid ranks over the past 26 months; standout wins over Lenroy Thomas for the Commonwealth title and Joe Hanks for the WBA continental trinket are enough for the Briton to hang his hat on coming into next month’s toughest test to date. In his eighth professional fight, it’s a huge step for the hard-hitting Londoner. If we compare the CVs at this stage of their careers of the three main men in the division – Anthony Joshua, Tyson Fury and Deontay Wilder – wins against the likes of Konstantin Airich, John McDermott and Jerry Vaughn, respectively, don’t size up to the Stiverne-based assignment ahead. This, however, is relative to Joyce’s age and amateur experience. At 33, it’s a case of now or never if the Juggernaut is gain a shot at world honours. It’s a common theme in today’s boxing that sparring stories will rear their ugly heads as soon as a pro fight is able to be made. DeGale and Eubank set the tone for this narrative on Feb 23. and Joyce and Stiverne have joined them with animosity building between the pair. After claiming he took Joyce to school when the pair sparred in Las Vegas, a vendetta is growing with Joyce adamant he will prove the sceptics wrong inside the ring. It’ll be a huge ask for Stiverne. Throwing just four punches in the mauling the 40-year-old suffered at the hands of WBC champion Deontay Wilder 14 months ago, inactivity and conditioning are likely to prove his downfall once again. He was nothing but a heavy bag in Wilder’s dissection of his head and body in November 2017, with the tough, resilient reputation of Stiverne simply growing old overnight. Joyce has heavy hands and an athletic work rate, and with flashbacks of being folded in half by Wilder’s barrage of windmills, Stiverne will need to be cautious against the hungry Londoner. Joyce is now ranked #5 with the WBA and off of the back of a win against Stiverne, he will be looking to press towards a world title shot in 2020. Stiverne – despite his standing as a former world champion – can’t be considered a gatekeeper. A win against one of the B-level heavyweights off the back of February’s outing will catapult Joyce to where he wants to be; this isn’t to say he will be overlooking Stiverne as an opponent. 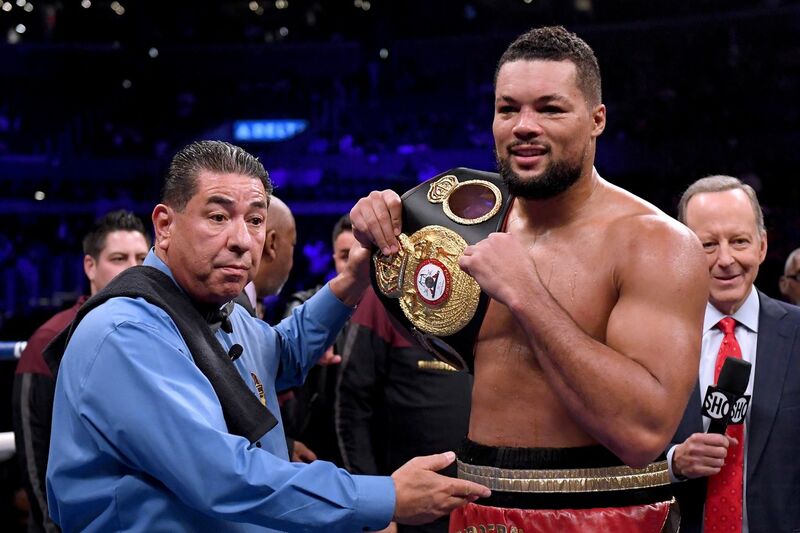 The winner of Manuel Charr vs Fres Oquendo is expected to face the victor in a Trevor Bryan vs Jarrell Miller bout in an attempt to solve the WBA’s ‘regular’ and ‘interim’ belt confusion. Other than the aforementioned, only Dillian Whyte is ranked higher than Joyce in a race to become Anthony Joshua’s mandatory for the WBA strap. I’m looking forward to seeing whether Joyce has what it takes to make a run at the world titles. The British heavyweight scene is alive and kicking currently, with the likes of Nathan Gorman, Hughie Fury and Daniel Dubois all aspiring to clamber up the heavyweight mountain in the next couple of years. Joyce is the front runner in this pack, and on February 23. we’ll begin to learn a lot more about his credentials in the land of the giants. I’d be shocked if Joyce doesn’t pass this test with flying colours. Stiverne is a real character in the heavyweights, but this next outing will emphasise how little has left to offer.